Options abound in the SMB-based market for network-attached storage. The market for network-attached storage devices aimed at small or midsize businesses suddenly offers some real choices with a range of features. No longer are these devices just "boxes of disks" with little differentiation. Companies can choose units for size, data redundancy, innovative back-up options, a do-it-all network unit or a combination of these features. We recently tested four devices - Anthology Solutions' Yellow Machine (the all-in-one unit), Infrant Technologies ReadyNAS 600, Iomega's 200d with REV drive and Netgear's Storage Central SC101. Newcomer Infrant delivered a great product that performs well and provides a complete management utility, and wins a Clear Choice Award. 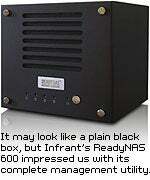 Infrant has a low public profile, but its ReadyNAS 600 box greatly impressed us. Offering several RAID options, the ReadyNAS forgoes the sleek and polished look of Buffalo Technologies' TeraStation for a businesslike squat black box with a fan grill above the hard drive LEDs. The ReadyNAS acts like an older-model NAS and works quite well when just plugged into the wall and connected to the network. The default settings give everyone access under standard Windows networking rules (\\ReadyNAS\ Backup and \Media are preconfigured). The four 232G-byte drives in our test unit were arranged as RAID-5, which left about 650G bytes of free space (subtracting the RAID overhead and space set aside for folder Snapshots). During the installation, the device downloaded a firmware update, installed it automatically and returned to the same browser screen administration page. This was the smoothest upgrade of the devices we tested. The system even sent us an e-mail stating that the newly upgraded box needed a reboot. Security settings will cover small, medium and large network customers. For small groups, share-level security, with or without passwords, is recommended. Midsize groups can use individual user passwords per share, or group accounts. If you have a Windows domain controller or Active Directory, the ReadyNAS relies on those services for user authentication. We added each unit to our lab network with a Xincom XC-DPG602 Dual Wan Router connected to Comcast Cable Internet with a failover link to Yahoo SBC DSL, and a Linksys EtherFast Auto-Sensing 24-port managed wiring hub, installed according to instructions, and populated the disks with files. Clients tested for connectivity include Windows XP Pro (SP2) running on an Intel P4 3.2MHz, 1GB RAM, mirrored 80GB hard disks, Windows 2000 (SP4) (Pentium III 700 MHz, 256MB RAM, 10GB hard disk HP Omnibook 500 Laptop), and Xandros Business Desktop Linux (Pentium III, 1GHz, 512MB RAM, 9GB SCSI disk). On the Yellow Machine, we configured the router for basic connectivity and tested the firewall setting followed by the most secure proxy server setting. The management utility, FrontView, offers a setup Wizard and advanced configuration settings. The utility is a standard left-menu, tabbed-page-on-the-right layout, but at least Infrant didn't get cutesy with graphics. Pages have clear markings, and its clean presentation didn't attract attention to itself and distract us. Genie Backup Manager Version 5.0 shipped with our test unit, but Version 6.0 now ships. It worked quickly and reliably. A journaling file system (the embedded Linux-based operating system distribution isn't revealed) includes disk-write cache by default. The Gigabit Ethernet port supports Jumbo Frames, which is handy if other devices also support this protocol. You can optimize performance for Apple OS X clients, but that will lock out Windows clients. Because Apple-only shops don't have many cost-effective NAS options, the ReadyNAS may make some inroads there. E-mail alerts can be sent to up to three addresses, with system events such as disk failure, quota violation, low disk space and even improper shutdown. ReadyNAS includes step-by-step instructions on how to perform a file-system check in the e-mail sent after an improper shutdown. Logs (system status and health) contained a nice balance of useful information without overload. One click e-mails a log page, and the system sends an exact HTML copy in the e-mail. The administrative browser utility also shows green, yellow and red lights in the bottom status line for the volume, individual disks, fan, power, temperatures and status of any attached UPS devices, giving users a quick glance of the system status. To replace hard drives, you have to take the case apart, and drives are not hot-swappable. RAID 0, 1 and 5 are supported, and you can vary the file system access list by network share. Common Internet File System /Server Message Block for Windows starts by default, AppleTalk File Protocol, Network File System Version 2 and 3, HTTP, Secure-HTTP and anonymous FTP can be included. Also supported is Rsync, a back-up protocol used by Linux and Unix. Streaming from the media shared folder supports networked DVD and media players, with options such as showing a slide show or setting the pixel rate (480i/480p, 720p or 1080i) for the targeted display. The ReadyNAS has a solid block of features with a complete and no-nonsense management utility. But the device also is fun for streaming music and watching the various disk LEDs dance along as the stored music files unwind across the striped disk array. Those who love putting everything in one basket will adore the Yellow Machine, from Anthology Solutions. This taxicab yellow NAS box also adds router and firewall features to its resume, and it does everything fairly well. You may blanche at the idea of making your file server your router/firewall, but it has been done before by Tritton and IOGear Boss, and can be handy for certain situations. Anthology updated this idea, and the Yellow Machine shoebox-sized unit comes stuffed with four hard disks (up to 2T bytes of total storage). Eight LAN ports in the back make this a router/hub, the security features provide a firewall, and the WAN port connects to your broadband modem. Befitting a box that wants to be the center of your network, installation requires plugging a PC directly into the Yellow Machine. A storage-only mode turns off the router/firewall features, but the eight LAN ports will still work. Turning on the router/firewall takes no more effort than any other small-business router, and it connected quickly to our Yahoo-SBC DSL modem, providing Internet access within minutes. Anthology says the Yellow Machine has a double firewall, but that is really a proxy server for maximum control over data flowing through the box. System security choices are NAS only, router, firewall and proxy. In NAS mode, the system follows standard Windows networking security settings. Router mode offers no security beyond standard network address translation, similar to other low-end routers. Firewall mode adds a basic stateful packet inspection feature. Proxy mode tracks and stops a wide variety of incoming and outgoing traffic, including Web access to unregistered users. It also records all e-mail traffic and blocks Web mail access. Individual PC profiles can be modified to allow such traffic, and port forwarding supports external system access or online games (if used in a home environment). We would have preferred to see a Gigabit Ethernet port on the box, but we were OK with the eight 10/100M bit/sec LAN ports (and the WAN port). The Yellow Machine Manager administration utility worked with Firefox (but just barely) and Internet Explorer 6.0 or above is supported. Cleverly, the Yellow Machine offers client backups from the NAS. To do this, we created a user and back-up folder, and told the device which shared client folders to back up and set a schedule. No client software was supported, but we had to go to the Yellow Machine's file system for file restoration, the flip side of having no client software. Configuring a Yellow Machine for a remote office or portable LAN hub would leverage the all-in-one nature. One unit to configure for file storage, network access and security makes sense for project teams traveling to another site, for example. Just plop the box in a room, connect some cables to laptops and you have an instant network. 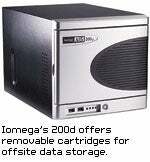 One of the leading storage vendors, Iomega makes NAS units that range across the SMB landscape. The makers of the Bernoulli Box and Zip disk have leveraged its REV high-capacity, small removable hard disk cartridges in an interesting way. The 200d we tested included a REV drive and cartridge. A REV cartridge holds 35G bytes native, and up to 90G bytes of compressed data, and is small enough to lose in a briefcase. Iomega now positions REV disks against tape drives for large back-up jobs, because the REV cartridges cost the same or less than many tape cartridges, yet read and write data much faster. Data can be read or written between NAS disks and the REV drive anytime, in any direction. Unlike the customized Linux OS, the 200d runs on Windows Storage Server 2003 software. Iomega says the Web-based administration pages work well until they dump you into Windows through a Remote Terminal connection, and the management interface changes completely. Users can be read from domain controllers or Active Directory, a nice inducement for Windows shops to go with Iomega. Windows brings with it the Shadow Copies feature for unit storage backup. Windows, Macintosh, Linux/Unix and Novell clients are supported. The 200d's case is quiet enough for office use and a door hides the two removable hard disks (not hot-swappable) and a REV drive. Four USB 2.0 ports that can add extra REV drives and a print server finish the package. The box also can send status and alert e-mails. Our unit had three removable disk slots with two hard disks (for 320G-bytes total) in a RAID 1 configuration (mirrored). The third slot held the REV drive. Backup is covered through bundled software from Computer Associates (BrightStore ARCserve), as well as Iomega's Automatic Backup Pro application. We used Automatic Backup Pro to write out files after each change, or scheduled clients to a schedule. In a market where some vendors forget about backup, this was a nice touch. The Windows operating system includes File and Print Services for NetWare (FPNW). Because Microsoft and Iomega don't include their own Novell-like client for access, they force you to violate the license on real Novell client software to use FPNW. Business-ready and solid, the 200d offers removable data cartridges for offsite data storage, something new in this market. Yet the price tag puts it at the high end in terms of dollars per gigabyte. Companies with Windows servers might pay the price for easy integration and the REV cartridge backup. Before rejecting this model, however, price tape drives with 35G bytes (or more) of storage capacity to see if the device is more easily justified. We were frustrated by the Netgear Storage Central SC101, from Netgear by way of Zetera's block-based storage-area network (SAN) technology that gets the price under most NAS boxes. Although the hardware looks great and works well when finally installed, the square SAN peg pounded into the round hole of the home and small-business market pushes technology into a market that doesn't need it. The unit comes without hard drives, turning this into a do-it-yourself project from the start (our unit came with two 120G-byte hard drives already installed). Second, only Windows XP (with Service Pack 2) or Win 2000 (with Service Pack 4) systems can play, because SAN drivers must be loaded onto each client PC for it to interact with the SC101. The management interaction occurs through the client software, because there's no browser-based administration utility. Users must work with disk drives identified by their IP address, although renaming the drives isn't hard once you get into the advanced configuration options. The unit is not visible in Windows networking utilities such as My Network Places, as well as Linux or Macintosh systems. Finally, limited ability to manage the drives created for each user compounds the concern of seeing what appears to be conflicting drive information in different administration screens. But the unit looks great. Smaller than a toaster, the SC101 has an aluminum top with a fin design that doubles as a heat radiator for the two drives. Three LEDs (power, network and disk activity) and a large screw that accesses the case adorn the front of the box. Intolerant of most personal firewalls, the client software uses specialized SAN drivers to communicate with the SC101. During client installation, it took many steps to establish communications, but it did map a logical drive letter to the SC101 unit. Netgear makes a big deal about this method of drive mapping, but every other NAS we've tried works fine with the "My Network Places > Tools > Map Network Drive" option that provides essentially the same results. 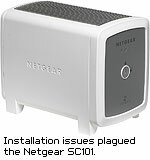 Only two of our three test PCs could successfully run the Netgear client software. The primary test PC, an Advanced Micro Devices-based unit with 734M bytes of RAM, could run the client software but couldn't connect to the SC101. We failed to create a new drive share with this PC, but the drive name would appear on the SC101 "available drives" list even after the failure messages. Unfortunately, we could never attach the drive and use the storage unit with our first PC. The other two PCs (an XP Professional desktop, and a Pentium III laptop running Win 2000 and connected wirelessly), could both attach drives and properly configure the unit. Client PCs carve some of the available disk space into a drive that can be made private or public, password protected or not and mirrored or not. If the drive is public, other users can attach to that drive, and it effectively becomes a local hard disk. The drive letter assigned by the installation process is the next available letter on the PC. Detaching an assigned drive on the SC101 deletes the space and contents after warnings. Drive spaces not created completely by our third PC were immune to attempts to manage directly and delete, making it appear as if the allocated space was unreachable, when it was available. Once installed properly, the SC101 worked well. The advantages of SAN technology don't appear with a single storage unit, however. For high-end home users, video streams well from the unit, but not noticeably better than from other units we tested. But the small unit is silent, and silence alone should be enough for audiophiles to make this their storage choice. Putting two 500G-byte drives in this case creates a terabyte of silent storage. For a midsize or larger network, the value of the IP-driven, switchless SAN technology can be realized. Mirroring drives between two separate physical devices is no problem. Mirror them through a WAN link to another location is possible, creating a valuable data redundancy feature. Netgear has a nice line of network equipment for midsize companies, and the technology of the Storage Central device will make a bigger splash in that market than in a home or small office setting. Gaskin can be reached at readers@gaskin.com. Gaskin is also a member of the Network World Lab Alliance, a cooperative of the premier reviewers in the network industry, each bringing to bear years of practical experience on every review. For more Lab Alliance information, including what it takes to become a member, go to www.networkworld.com/alliance. Price 640G bytes, $1,400; 1T byte, $1,600; 1.6T bytes, $2,400. Suggested retail pricing on the 1T byte appliance is $1,300, and pricing for the 1.6T byte machine is $2,000. 320G bytes, $1,400; 480G bytes, $2,000. $125 without hard drives; hard drives sold separately. Pros Clean administration; flexible; supports every client around. Lose some ease of use with the increased flexibility. Complete network in one yellow box; server-based backup. Easy Windows network integration, REV drive for backup. Small, silent, new technology. Client installation problems; advantages don’t fit target market.